1917 recruiting poster for the United States Navy, featuring a woman wearing the most widely recognized uniform, the enlisted dress blues by Howard Chandler Christy. ✪ New US Navy Uniforms - Is it Ugly? ✪ Why Indian Navy Uniform Is White? Do You Know Why Indian Navy Uniform Is White In Color? The United States Navy has three categories of dress uniforms, from least to most formal: service, full, and dinner dress. Service dress uniforms are worn for official functions not rising to the level of full or dinner dress. They are also commonly worn when traveling in official capacity, or when reporting to a command. The civilian equivalent is a business suit. They are seasonal, with the white uniform worn in summer and the blue in winter. Service Dress Blue may be worn year round for travel only. Ribbons are worn over the left breast pocket in all variations of the service dress uniform. The All-Weather Coat, Overcoat, or Reefer may be worn with service dress uniforms in cold or inclement weather. A navy officer wearing Service Dress Blues, inspects enlisted sailors in their service dress blue "crackerjacks" in February 2008. A female U.S. Navy officer in a Service Dress Blue uniform. A female chief petty officer wearing the unisex combination cover that was introduced in 2016 and replaced the distinct female versions in October 2018. The Service Dress Blue (SDB) uniform consists of a dark navy blue suit coat and trousers (or optional skirt for women) that are nearly black in color, a white shirt, and a black four-in-hand necktie for men or a neck tab for women. The material is generally wool or a wool blend, depending on the vendor. The men's jacket is double breasted with six gold-colored buttons, and the women's jacket single breasted with a single row of four gold-colored buttons. Rank insignia is the gold sleeve stripes for commissioned officers, while rating badges and service stripes are worn on the left sleeve by chief petty officers (CPOs). The prescribed headgear is the white combination cap, although a navy blue garrison cap is optional, unless stated otherwise by the prescribing authority in some situations when the jacket is not worn. Beginning in 2016, the Navy began phasing out the distinct female combination cap and now prescribes a cover similar to the male version for female officers and CPOs; the prior female versions were authorized for wear until October 2018. Commissioned and warrant officers wear a cap badge of the American shield and eagle in silver upon gold crossed anchors; CPOs wear a single fouled anchor. The combination cover's chinstrap is gold for commissioned and warrant officers, narrower gold for midshipmen, and black for CPOs. Female officers and chief petty officers typically wear beltless slacks with the SDB, although since January 2017, belted slacks can be worn as an alternative. The Service Dress White uniform has until recently been different for the men's and women's variations. Men wear a high stand-collared white tunic, with shoulder boards for officers or the metal anchor collar devices for CPOs, white trousers, and white shoes. This uniform is informally called "chokers" due to the standing collar. The material, formerly cotton, today is a weave of polyester known as "Certified Navy Twill". The white combination cap is the prescribed headgear. Women previously wore a uniform similar to the Service Dress Blue uniform but with a white coat and skirt or trousers. Officer's rank insignia consisted of lacing on the sleeves in the same manner as on the blue uniform, while CPOs wore rank insignia pins on the lapels of the jacket. However, the Navy has announced female uniform changes to resemble the men's uniforms, and female officers and CPOs began wearing stand-collared tunics similar to the male uniform in early 2017, with full replacement of the old-style uniform by January 2020. Service Dress Blues for male junior enlisted sailors are based on the classic sailor suit in navy blue, colloquially referred to as "crackerjacks" because of the sailor-suited figure that adorns the packaging of Cracker Jack snacks. They consist of navy blue wool jumper with three rows of white stripes on the collar and cuffs. There are two white stars, one at each corner of the collar. A black silk or synthetic fiber neckerchief, rolled diagonally, is worn around the neck, under the collar, with the ends tied in a square knot in the center of the chest. The trousers for the uniform are flared as "bell bottoms". The trousers have traditionally featured a broad-fall opening, though changes to the trouser announced in 2012 have added a zippered fly, rendering the buttons merely decorative. A traditional white hat or "Dixie cup" is also worn, as well as black leather shoes. Since the 1970s, female junior enlisted sailors' Service Dress Blue uniform has been similar to the CPO/Officer service dress blues, with the exception that silver-colored buttons, rather than gold, are on the jacket. This uniform is being phased out and will be replaced by a female-cut variant of the "crackerjacks" with the transition begun in October 2016 and to be completed by January 2020. Until 2016, the Service Dress Whites, for both sexes, consisted of a white jumper with plain collar, white straight-leg or bell-bottom trousers with a fly front (or optional skirt for women), black leather shoes, the black neckerchief worn in the same fashion as with the Service Dress Blues, and the white Dixie cup cap for males and combination cover with a silver eagle emblem and the letters "USN" for females. The Service Dress White jumper is actually derived from the former Undress White, with its wide cuff-less sleeves and no piping. However, beginning in October 2015, Service Dress White jumpers were changed to feature navy blue piping on cuffed sleeves, stars and navy blue piping on the collar, and a yoke, making it a 'photo-negative' of the Service Dress Blue jumper. Ribbons are worn with these uniforms over the top left pocket opening, along with qualification or warfare insignia. Either the all-weather Coat or peacoat may be worn with this uniform in cold or inclement weather. The color of the enlisted rank insignia and service stripes for the Service Dress Blues is either red or gold based upon the U.S. Navy Good Conduct Variation. The colors on the Service Dress Whites are always black. A navy captain's "Full Dress Blue Uniform" with full-sized medals, white gloves and sword. Officers wearing Full Dress Whites worn at a Change of Command Ceremony in October 2009. Enlisted Full Dress Whites worn at a Change of Command Ceremony in 2009. This is the older-style version that is due to be replaced in 2021; it lacks the black piping on the cuffs. Full Dress uniforms are worn for ceremonies such as changes of command, retirements, commissionings and decommissionings, funerals, weddings, or when otherwise appropriate. Full Dress is similar to Service Dress except that instead of ribbons, full-size medals are worn above the left breast pocket, with ribbons worn on the opposite side for decorations without corresponding medals. Swords or cutlasses are authorized for wear by officers and chief petty officers, and may be required for Lt. Commander and above. For the U.S. Navy Ceremonial Guard in Washington, D.C., the enlisted (E6 and below) Full Dress uniforms are further modified with the wearing of a white pistol belt, ascot, and dress aiguilette (the latter two are white for winter and navy blue for summer), and white canvas leggings. Other honor guards are only authorized leggings and white pistol belt. The dinner dress uniforms of the United States Navy are the most formal and have the most variations. For officers, there are Dinner Dress Blue and Dinner Dress White, Dinner Dress Blue Jacket and Dinner Dress White Jacket, and Formal Dress. Although trousers are authorized, women frequently wear the appropriate color skirt. Dinner Dress Blue and White are identical to their Service Dress versions, but worn with miniature medals and badges with no ribbons. Dinner Dress Blue is additionally worn with a dress shirt and black bow tie. These variants are commonly worn by many junior officers and enlisted personnel as substitutes for the more formal Dinner Dress Jacket variant which is only prescribable for Lieutenant Commander and above and optional for Lieutenant and below. The Dinner Dress Blue/White Jacket uniforms feature a short jacket with three buttons on either side, worn open with a black bow tie and cummerbund (women substitute a neck tab for the bow tie). Male officers show rank stripes on the sleeves of the jacket for the blue version and on shoulder boards for the white version, while women officers only wear sleeve stripes. This uniform is equivalent to black tie in usage. The Formal Dress variation is the most formal, and is identical to the Dinner Dress Blue Jacket uniform but worn with a white waistcoat with gold buttons in place of the cummerbund, a white bow tie, and matching mother-of-pearl studs and cuff links. Though rarely used, men can also substitute a tailcoat for the standard dinner dress jacket with this uniform. The female version is substantially the same as Dinner Dress Blue Jacket, but substitutes the mother-of-pearl studs and cuff links for gold. This uniform is equivalent to white tie in usage. Additionally, this uniform is only prescribed for chiefs and officers. Headgear is not required for dinner dress uniforms unless an outer jacket is worn. Those holding the rank of lieutenant and below have the option of using the Dinner Dress uniform when Dinner Dress Jacket is prescribed. The enlisted sailors who are chief petty officer and above wear a uniform similar to the officers, but with rank insignia and service stripes on the left sleeve. While enlisted who are petty officer first class and below have optional Dinner Dress Jacket uniforms similar to the officers and chiefs, they may also wear their Dinner Dress uniform, which is the traditional Service Dress "sailor suit", with miniature medals instead of ribbons. Service uniforms are the U.S. Navy's daily wear uniforms, and exist in several variations. They are intended for use in office environments, in positions that interact with the public, and in watch situations. Skirts are authorized for women in all service uniforms. U.S. Navy chief petty officers wearing the Service Khaki uniforms with the soon-to-be discontinued female "bucket-styled" combination covers in September 2006. The Navy first authorized a khaki uniform in 1913 as a practical garment for early naval aviators; they were given permission to wear Marine Corps khaki uniforms with naval insignia, when flying or working on aircraft. Khakis were authorized aboard submarines in 1931 and as a working uniform on all ships ten years later. The Service Khaki uniform today is reserved for commissioned officers (grades O-1 through O-10), chief warrant officers (current grades W-2 through W-5; W-1 is not in use) and chief petty officers (grades E-7 through E-9). It is a khaki button-up shirt and trousers, worn with a gold belt buckle. The shirt features two front flap pockets and a pointed collar. Ribbons are worn above the left pocket of the shirt, with the warfare insignia above them. A nametag may be worn above the right pocket, and rank insignia is worn on the collar. The regulations for ribbons state the highest three awards, or all ribbons can be worn at once. There are two kinds of headgear authorized: a khaki combination cap is standard, but a khaki garrison cover is also authorized. Currently black and brown oxford shoes are authorized for all officers and CPOs. However, tradition and social pressure tend to restrict the wearing of brown shoes to members of the aviation community. Females are authorized to wear the same over-blouse as junior enlisted sailors. The Summer White Service uniform (formerly known as Tropical White Long; nicknamed the "milkman" and "Good Humor") consists of a short-sleeved white button-up shirt worn open-collared, white trousers and belt, and white dress shoes. Authorized headwear is the combination cap. Officers wear shoulder boards with this uniform, while chiefs wear metal collar insignia. The women's shirt for all ranks has shoulder straps, but carry nothing except for shoulder boards worn by officers. Like Service Khakis, Summer Whites are available in several materials (poly/cotton and Certified Navy Twill). When assigned as the Uniform of the Day, a Plan of the Day/Plan of the week will state "Summer White." Either the All-Weather Coat, Blue jacket, or Peacoat may be worn with this uniform. While once authorized for junior enlisted, it is now restricted to officers and chiefs. Members E-6 and below previously wore a short-sleeved Summer White uniform with rate insignia on the left sleeve, but the uniform was discontinued by the Navy in December 2010. The U.S. Navy underwent a comprehensive review of every uniform from 2004 through 2007, intending to replace the different working uniform for all hands and the seasonal service uniforms with a single year-round service uniform for personnel E-1 through E-6. Accordingly, the Navy Service Uniform has replaced the Winter Blue Uniform and Summer White Uniform (both discussed below), which were phased out on 31 December 2010 when the rollout of the new service uniform was completed. Enlisted personnel now have a single Service Uniform. Navy Junior ROTC units also received this new uniform, where, unlike in the U.S. Navy proper, it is worn by both cadet officers and enlisted cadets. The Navy Service Uniform is a year-round service uniform to withstand day-to-day classroom and office-like environments where the service uniform is typically worn. It consists of a short-sleeve khaki shirt for males and a khaki weskit-style blouse for females, made from a wash and wear 75% polyester, 25% wool blend, with permanent military creases, black trousers for males with beltless slacks for females and optional beltless skirt, and a black unisex garrison cap. Silver anodized-metal rank insignia is worn on shirt/blouse collars and cap. The service uniform also includes a black relaxed-fit jacket with a knit stand-up collar and epaulets, on which petty officers wear large, silver anodized-metal rate insignia. Those entitled to wear gold chevrons continue to wear gold chevrons on the large metal rate insignia on the jacket. Working uniforms are described by the navy as being worn when other uniforms may become unduly soiled or are otherwise inappropriate for the task at hand. These are worn at sea and in industrial environments ashore. In July 2010, the Navy Working Uniform and coveralls became the only authorized working uniforms. V-neck sweaters were authorized with coveralls until 2015. A female officer wearing the NWU Type III in AOR-2. A male navy officer wearing the NWU Type I; the uniform is due to be retired in 2019. A digitized rendition of a swatch of AOR-2, the camouflage pattern used on the NWU Type III. 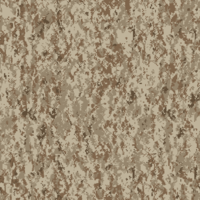 A digitized rendition of a swatch of AOR-1, the camouflage pattern used on the NWU Type II. The Navy Working Uniform (NWU) is a utility uniform with multiple pockets on the shirt and trousers. Three versions of the uniform exist, each with a multi-color digital camouflage print pattern similar to those introduced by other services. Type I is predominantly blue with some gray for the majority of sailors. It was originally developed for shipboard use, but proved unsuitable for shipboard environments and is due to be discontinued in 2019. Type II is a desert digital pattern currently restricted to SEALs and other sailors such as Seabees assigned to Naval Special Warfare Units when in desert environments. Type III is a woodland digital pattern for sailors in shore commands and riverine units. The camouflage patterns are similar to the MARPAT Marine Corps Combat Utility Uniform worn by U.S. Marines. The colors of the NWU Type I, according to the U.S. Navy, were intended to reflect the navy's heritage and connection to seaborne operations, while hiding wear and stains, something unavoidable with the utilities and working khakis used previously. The colors were chosen to match the most commonly used paint colors aboard ship, extending the lifetime of the uniform on long deployments where uniforms often come into contact with freshly painted surfaces. An anchor, USS Constitution, and eagle (ACE) emblem is embroidered on the left breast pocket on all Type I NWUs. Accessories include a navy blue cotton T-shirt, an eight-point utility cover, and a web belt with closed buckle. The uniform is worn with rank insignia on both collar points and on the front panel of the utility cover, with sew-on name and "U.S. NAVY" tapes, also on the new digital background pattern, having gold-colored lettering for officers, CPOs and midshipmen. All ranks below CPO wear silver-lettered name tapes. The NWU Type I was phased into service beginning in January 2009. The Type II and III patterns are overall darker than their respective MARPAT progenitors, modified with different color shades and a vertically-aligned pixel pattern for the woodland version (compared to the horizontal alignment of woodland MARPAT). The additional patterns addressed the fact that the blue and grey Type I pattern was not meant for a tactical environment. Rank insignia is embroidered and worn on a tab in the center of the torso, name and "U.S. Navy" taps are embroidered in brown (Type II) or black (Type III). Backlash from Marines, including an objection from Commandant Conway, led to restrictions when wear regulations were released in 2010. The Type II is restricted for wear to Naval Special Warfare personnel, while Type III was restricted to Navy ground units until late 2016. The ACE emblem is omitted from the NWU Type II and NWU Type III. The uniforms are primarily composed of a 50/50 nylon and cotton blend, which eliminates the need for a "starch and press" appearance and reduces the possibility of snags and tears from sharp objects (thus making the garment last longer). However this blend combines high flammability with the strength to hold onto the sailor's body while burning. In August 2016 the U.S. Navy announced that it is eliminating the NWU Type I in favor of the Type III which will completely replace it by 1 October 2019 for wear as the standard working uniform ashore for all Navy personnel. Type III will begin being issued to new navy recruits in October 2017. The Type II will remain restricted to wear by Naval Special Warfare sailors when in desert environments. The Navy's goal of developing a single working uniform for wear aboard ship and ashore and by all ranks and rates which the NWU Type I was supposed to fulfill was never realized by the Type I. Soon after its introduction it was found to be unsuitable for shipboard wear because of its lack of flame resistance and so was banned from wear aboard ship (except for when in port) thus making it essentially a uniform to be worn while ashore only. As a uniform for wear ashore only, a pattern designed to conceal stains aboard ships is not nearly as effective at concealment as a pattern designed to conceal people on land, thus the IIIs are used ashore. The Navy continues to work to develop a new shipboard working uniform. All-weather garments include a unisex pullover sweater, a fleece jacket, and a parka, all of which are available in matching camouflage patterns. Beginning in 2016 the Navy had planned to also issue a lightweight version of the NWU Type I more suitable to hot environments. Black safety boots, identical to those worn by United States Coast Guard personnel with their Operational Dress Uniform, are worn with the NWU Type I. Brown or tan boots can be authorized for wear with the Type II and III, though black is the standard color for sailors located in the contiguous United States. Boots come in two versions: black smooth leather boots, and black suede no-shine boots for optional wear while assigned to non-shipboard commands. A navy seaman wearing flame-resistant "FRV" coveralls in 2015. A navy quartermaster in 2014 wearing poly/cotton coveralls. The poly/cotton coveralls have largely been replaced by the flame-resistant variant, though it is still authorized for wear by the navy. The U.S. Navy issued a new model coverall for use as a shipboard working uniform beginning in early 2014. The new flame resistant variant (FRV) coverall is used aboard all ships. It has largely replaced for shipboard use polyester cotton blend coveralls that provided inadequate fire protection and the NWU Type I for the same reason. The all cotton FRVs are dark blue in color compared to the older coveralls, which are lighter. They use rectangular velcro-backed nametags similar to those worn on flight crew suits, rather than the nametapes of the previous coverall. U.S. Fleet Forces Command (FFC) continues a multi-phase wear test of improved flame resistant variant (IFRV) working uniform components for shipboard wear. FFC most recently conducted in-depth focus groups with fleet sailors aimed at refining the design of the IFRV coverall. The IFRV coverall was approved for issue on 17 January 2017. Additional feedback from the focus groups, subsequently validated by a senior level working group, resulted in the preliminary design of a more professional looking two-piece utility shipboard uniform that can be worn both at sea and operational support jobs ashore. Wear tests of the prototype two-piece variants are expected to occur in 2017. All enlisted sailors may wear the navy blue pea coat with a rate insignia for petty officer third class and up on the left sleeve, a navy blue "All Weather Coat" with rate insignia worn on the collar, or a navy blue Working Uniform Jacket with rate insignia worn on the collar. Officers and chief petty officers may wear the calf-length wool "bridge coat" or waist-length reefer, with gold buttons and rank insignia worn on the shoulder boards, or the all-weather coat, with rank insignia also worn on the shoulder or collar, depending on rank. All sailors are authorized to wear the "Eisenhower" jacket with short-sleeved service uniforms with appropriate rank devices on the shoulder boards. The "Eisenhower" jacket is a waist length, black jacket with knit cuffs, and is named for its association with Dwight D. Eisenhower. The khaki windbreaker, previously authorized only with the service khaki uniform, was discontinued on 30 September 2016. Naval aviators, naval flight officers, naval flight surgeons, naval aviation physiologists, and naval aircrewmen are authorized to wear G-1 seal-brown goatskin-leather flight jackets, with warfare insignia listed on a name-tag (rank optional) over the left breast pocket, either permanently stitched to the leather or attached with a Velcro hook-and-loop fastener. These jackets were previously adorned with various "mission patches," which indicate places the wearer has served. Today, patches on the G-1 are limited to a maximum of three in addition to the name-tag, i.e., a unit insignia on the right chest pocket, an aircraft type insignia on the right sleeve and an aircraft type insignia or embroidered U.S. flag on the left sleeve. Also, the Navy issues foul-weather or cold-weather jackets as appropriate for the environment, which are generally olive or Navy blue in color. These jackets are considered "Organizational Clothing". They do not belong to the sailor, and are not allowed for wear off of the ship unless working in the near vicinity of a ship. Members of the Navy Band, regardless of rank or rate, wear officer/chief petty officer-style uniforms. Corpsman wearing the Marine Corps Service Uniform in 2007. As the Marines do not have medical personnel and chaplains, the Navy provides them. The officers and enlisted include doctors, physician assistants, dentists, nurses, hospital corpsmen, chaplains, religious program specialists, and Naval Gunfire Liaison Officers. There are also specialized ratings that will be attached to Marine commands such as Navy Divers for example. Because of this relationship, these personnel are authorized to wear U.S. Marine Corps utility (desert/woodland) uniforms with Navy rank insignia replacing the Marine insignia for enlisted personnel (Navy and Marine officer rank insignia are identical) and with a "U.S. Navy" patch replacing the "U.S. Marines" one. They wear the 8-point utility cover, but it lacks the Marine Corps emblem. Additionally, Navy personnel attached to Marine units can elect to wear Marine service uniforms, with Navy insignia. Those opting to wear Marine Corps service uniforms must meet Marine Corps grooming and physical appearance standards, which are more stringent than Navy standards. This does not apply to the MARPAT uniforms, as this uniform is required for wear in the field when attached to Marine units, regardless of adherence to Marine Corps grooming standards. Navy personnel are not authorized to wear the Marine Corps Dress Blue Uniform; instead Navy Dress Blue and White uniforms are worn. In addition to Marine Corps detachments, combat utilities are also worn by Navy SEAL teams, along with SWCC crews who conduct clandestine maritime operations including supporting SEAL platoons and SOF cells. The Combat Utility Uniform (CUU) is authorized for those in the Explosive Ordnance Disposal (EOD) and Fleet Diver communities. Combat utilities are also authorized for those attached to the Naval Construction Force (NCF) (Seabee), Navy's Expeditionary Logistics Group, or the Navy's Expeditionary Combat Command (NECC). Also, Navy personnel assigned to some joint headquarters units, like Central Command in Qatar and Iraq, wear Desert Utility Uniforms (DUU). Navy personnel such as Individual Augmentees, Combat Camera Groups, Detainee OPS, and some in the special warfare community have been wearing the Army's ACU (Army Combat Uniform) when working closely with or attached to Army commands. Pilots, Naval Flight Officers, and Naval Aircrewmen are authorized to wear green or desert flight suits (made of nomex for fire protection), with rank insignia for officers stitched on the shoulders, and a name tag/warfare insignia on the left breast pocket. Either a Command/Navy ballcap or a Khaki Garrison Cap (for Commissioned Officers and CPOs) are worn with this uniform. Green flight suits are the standard wear; however, wing commanders may authorize desert flight suits for personnel located in hot climates. As of 2012, flight suits may now be worn off base in the same manner as the Navy Working Uniform. Coveralls are authorized to be worn with either the all-weather coat or utility jacket (for petty officers only). The ship USS Constitution is the oldest commissioned ship in the U.S. Navy, the only one of the six original United States frigates still in existence. Constitution is presented to the public as the ship appeared during the War of 1812, and personnel stationed aboard Constitution still wear uniforms according to regulations posted in 1813. These uniforms are worn on ceremonial occasions, such as the annual turn-around cruise in Boston every Independence Day. Midshipmen at the United States Naval Academy, in addition to regular Navy uniforms, also wear parade dress of traditional 19th-century military cut, waist-length tunics with stand collars and double rows of gold buttons. Navy Uniform Regulations Change No. 11 issued 22 June 1917 authorized naval aviators to wear a summer service flying uniform of Marine Corps khaki of the same pattern as the officers' service dress white uniform tunic and trousers. It was to be worn with high, laced tan leather shoes only "when on immediate and active duty with aircraft", and might be worn under similarly colored moleskin or khaki canvas coveralls as a "working dress" uniform. Naval aviators typically flew patrol bombers from shore bases until the first United States aircraft carrier USS Langley was commissioned on 20 March 1922. Differing uniforms afloat precipitated a 13 October 1922 Bureau of Navigation letter: "Uniforms for aviation will be the same as for other naval officers, doing away with the green and khaki, which may be worn until June 1, 1923, but only at air stations." Khaki aviation uniforms of a somewhat different pattern were reinstated on 8 April 1925. Two naval officers showcase the now-discontinued service dress khaki uniform in September 2007. During World War II, a single-breasted heavy cotton twill jacket with shoulder boards was worn with cotton twill trousers over a long-sleeved cotton shirt with a black necktie as "Service Dress Khaki", allowing cleaning in shipboard laundry facilities. Later on, through the Vietnam War, the trousers and jacket were often made of light wool or wool-blend fabric as routine access to dry-cleaning facilities became available. The uniform was dropped in 1975 by then-Chief of Naval Operations, Admiral Elmo Zumwalt, in order to reduce the number of items in the officer's seabag. A revived version of the uniform was announced in 2006 on a test basis. It was authorized for wear by commissioned officers and CPOs during the summer months and in tropical climates. The uniform reintroduced a khaki service coat worn with a black necktie and shoulder boards. It was intended to provide a more practical alternative to the Service Dress Whites and a more formal alternative to the Service Khakis. This uniform was frequently worn in public by Admiral Mike Mullen during his time as Chief of Naval Operations and Chairman of the Joint Chiefs of Staff; Mullen was seen wearing this uniform with the jacket removed in the photograph in the White House Situation Room during the Navy SEAL raid on Osama bin Laden's compound. In October 2012, cost considerations led to the cancellation of the full-scale reintroduction of the uniform, and the uniform was dropped from the Navy. The rarely seen Service Dress Blue Yankee uniform replaced the dark trousers and black shoes of Service Dress Blue with white trousers and shoes from the white uniform. Prescribed for officers. The Winter Blue uniform was authorized for all ranks. Due to its near-black color, it was called the "Johnny Cash" uniform (a reference to the song/album Man in Black by the singer of the same name). It was a long sleeve black button-up shirt and black belt and trousers (optional skirt for females), with the headgear either the combination cover (all E-7 and above, female E-6s and below) or white Dixie Cup (male E-6s and below). Garrison caps were an optional secondary headgear, allowed to be worn for all ranks. As a service uniform, ribbons and badges were worn, and officers and chief petty officers wore metal collar insignia, while enlisted E-6 and below wore just the rating badge on the left arm. All men wore ties, females necktabs, with an optional silver clip for sailors at the rate of petty officer first class and below, others a gold clip. The Working Khaki uniform was worn by officers and chief petty officers, primarily aboard ship or in selected working areas at bases ashore. Originally it was simply the Service Dress Khaki uniform worn without the coat and tie. Similar to, but less formal than, the Service Khaki, it consisted of a short or long-sleeve khaki uniform shirt, with warfare insignia and badges (i.e. command pins, nametags, etc., but no ribbons) worn on the top of the left pocket, and pin-on metal rank devices located on the collar. It also came with a set of khaki trousers, a khaki belt with a gold belt buckle, a command or "U.S. Navy" ballcap (garrison cap optional), and black or brown low quarter shoes, black or brown boots, or black leather safety shoes. It was often referred to as the "Wash Khaki" uniform, because it was a 100% cotton uniform that could be laundered but required pressing, differentiating it from the Summer Khaki made of Certified Navy Twill (CNT) or a poly-wool blend that is considered acceptable for wear ashore and off base, but which requires dry-cleaning. At the beginning of January 2011, the working khakis were replaced by the Navy Working Uniform, although the Navy Junior ROTC still uses them. A winter working green uniform for commissioned officers and Chief Petty Officers in the Naval Aviation community was authorized on 7 September 1917 in conjunction with adoption of the naval aviator wings breast insignia. The initial uniform pattern was the same as the officers' service dress white uniform tunic and trousers. Like the summer khaki uniform, it was to be worn with high, laced tan leather shoes. Like the aviation khaki uniform, the green uniform was temporarily banished during the early years of United States aircraft carrier operations from 1922 until a modified design was reauthorized in 1925. The final version, discontinued in January 2011, was somewhat similar to the Navy's revived Service Dress Khaki uniform in cut and design and bore additional similarities to the Marine Corps' Service Dress "Alpha" green uniform. It consisted of a green wool coat and green wool trousers with bronze buttons and a long-sleeve khaki shirt with black tie. Rank insignia consisted of black embroidery on sleeves in a style similar to the gold sleeve braid for officers, or rating marks and service "hash" marks for Chief Petty Officers, on Service Dress Blue uniforms. Metal rank insignia was worn concurrently on the collar points of the khaki shirt by line officers and CPOs. For staff corps officers, rank insignia was worn on the right collar point and staff corps insignia on the left collar point (typically Medical Corps for Naval Flight Surgeons, etc.) of the shirt. Warfare insignia and, if applicable, Command at Sea and/or Command Ashore insignia, were worn on the jacket and optionally on the shirt. Command nametags were also optional on both the blouse and/or shirt. Brown shoes were typically worn, although this transitioned to black between 1975 and 1986 when brown shoes were discontinued. Following the reinstatement of brown shoes in 1986, brown shoes again became the most common footwear. Authorized headgear included a combination cover in green, or a green garrison cover. During World War II and the Korean War, ribbons were also authorized with this uniform, making it a de facto "service uniform" or "liberty uniform," authorized for wear off base. But by the early 1960s, it had become limited to that of a "working uniform" for use on base or aboard ship only. It was infrequently worn, primarily due its expense and its 100% wool fabric that typically made it unsuitable outside of the winter months; in the working environments where AWGs were authorized, aviators typically found working khakis or flight suits more convenient. The AWG uniform was formally phased out on 1 January 2011 along with several other uniforms as part of an extensive U.S. Navy uniform consolidation. The Type I Navy Working Uniform took its place. The rarely seen Tropical White Uniform (also referred to as Tropical White Short) was similar to the Summer White Service uniform, except white knee shorts and knee socks were worn. It was colloquially known as the "Captain Steubing" uniform, after the character on The Love Boat TV show. Exceptionally rarely worn, though authorized with this uniform, was a pith helmet, with a Naval Officer's insignia at the front, above the brim. Tropical working uniforms existed, but were variations on the working khaki and utility uniforms. Knee shorts and black knee socks are worn, along with short sleeved button-up shirts. Initially worn by E-6 and below beginning in the mid-1970s with the temporary phaseout (until 1982) of the traditional "crackerjack" uniforms, it was later expanded to include chief petty officers and commissioned officers. Best known by the nickname "salt and peppers," the uniform consisted of a summer white shirt and winter blue (e.g. black) trousers for males and summer white blouse and winter blue trousers or winter blue skirt for females. Headgear consisted of a combination cover (e.g., coinciding with the mid-1970s/pre-1982 period when use of the "crackerjack" uniform and "Dixie Cup" headgear was suspended for male E-6 and below) and black shoes. Although naval personnel still retained all the components that made up this uniform, its use was discontinued in 1983. Though the U.S. Navy proper discontinued the uniform in 1983, Navy Junior ROTC units continued to wear it for decades after, until they themselves finally discontinued their usage in June 2010. This short-lived uniform for officers and CPOs was only authorized from 1943–49, but was a common sight on the East Coast and in the Atlantic/European Theater during World War II. It was identical in cut and material to the Service Dress Khaki uniform but medium gray in color with black buttons, worn with a lighter gray shirt and garrison or combination cover. Officers' shoulder boards were likewise gray, with stars/corps insignia and rank stripes in black. "Working grays" were the same uniform worn without the jacket and tie. The gray uniform was introduced by then-Chief of Naval Operations Ernest King, who thought khaki was more appropriate to land forces; Admiral Chester W. Nimitz disliked it and discouraged its wear in the Pacific Fleet. From 1893 until 1975, chief petty officers wore a Service Dress White uniform consisting of white cotton trousers and double-breasted reefer jacket with black necktie. Rating badges and service stripes in black were worn on the left sleeve. This uniform was also worn by members of Navy bands regardless of rank. Officer-pattern whites were authorized for CPOs in 1981. Dungarees consisted of a short or long-sleeve blue chambray shirt, white T-shirt, and bell-bottom denim jeans (the jeans in question had heptagonal "patch" pockets sewn on the front of the pant-legs rather than the traditional "slash" pockets often seen on civilian-worn jeans). Head gear was the white "dixie cup" cover for men and an early form of the black garrison cap or a black beret for women; after graduation from boot camp, the command ball cap was optional (and in practice more common). Starting in 1995, the white hat was no longer authorized for wear with dungarees, and the command (or Navy) ballcap became the predominant cover. During cold weather a black watch cap was allowed. The sailor's last name was stenciled in white on the pants just above the back pocket on the right side. The name was also placed in black on the shirt just above the right breast pocket, usually stenciled on. Names could also be reinforced with embroidered thread of the appropriate color on both the pants and shirt. Rate badges (for petty officers) and warfare devices were iron-on. The rate badges consisted of an all-black eagle (nicknamed a "crow") and chevrons, omitted the rating device found on other enlisted uniforms' rate badges. Low black leather boots called "boondockers" were issued with the dungaree uniform, however, sailors were allowed to wear black leather jump boots. Flight deck personnel were issued a type of taller cap-toe boot similar in design to jump boots known colloquially as "wing walkers". These types of boots had zig-zag patterned out-soles to avoid gathering FOD (Foreign Object Debris) between the ridges that could litter the flight deck and cause potential damage to aircraft. "Dealer/Chelsea" style ankle boots (known colloquially as Lox boots) with elastic-sides were issued to personnel working with Liquid oxygen for easier removal in case the boots would freeze upon contact. A navy corpsman in 1999 wearing the "dungaree" uniform. A navy sailor wearing the "utility" uniform in 2009. The enlisted utilities uniform was worn by junior enlisted sailors, from paygrades E-1 to E-6, from the mid-1990s until 2010, when they were phased out in favor of the NWU. Utilities consisted of dark blue chino cloth trousers with a polyester–cotton blend shirt, and were considered an updated version of the dungarees uniform. Utilities were meant to be worn in a working environment but were authorized to be worn outside military installations, unlike coveralls. Usually sailors wore the command ball cap with this uniform, although a black watch cap was allowed in cold weather; the white "dixie cup" hat was worn for special ceremonies such as the dignified transfer of a decedent. Cloth name tapes were worn similar to that used on utility uniforms of the other services. In 1995 a tape with the words "U.S. NAVY" began being included above the left breast pocket with embroidered enlisted warfare insignia authorized above it, and an embroidered rating badge. The footwear for this uniform was full black, round-toed boots (referred to as boondockers), preferably with steel toes. The blue utility jacket was authorized in climates not cold enough as to warrant wearing the black All-Weather Coat. Prior to the introduction of the Winter Blue/Winter Working Blue uniform, personnel E-6 and below in office and classroom environments were authorized to wear the Undress Blue uniform; this broadly resembled the Dress Blue "crackerjack" uniform but carried no piping or stars, and the sleeves were wide and cuffless like those of the current Dress Whites. Before 1941 this was the standard working uniform for all "above-deck" duties since dungarees were not permitted anywhere the public might see them. Ribbons and neckerchief were not worn and the uniform was not authorized for liberty. Until 1941, the summer and tropical equivalent to the Dress Blue "crackerjacks" was a white cotton jumper uniform with blue tar flap and cuffs, adorned with white piping and stars like the blue uniform. This uniform was discontinued "for the duration" and was never reinstated; instead the Undress Whites with the addition of ribbons and neckerchief became the summer dress uniform for sailors. U.S. Navy sailor James R. Ward wearing the Flat Hat. From 1852 until 1962 (although in practice rarely worn after the middle of World War II), enlisted sailors were issued a round, flat blue wool hat with a ribbon around the band similar to that worn by the Royal Navy. The "Donald Duck" was worn with the Service Dress Blue uniform on more formal occasions in lieu of the white "Dixie cup." The ribbon carried the name of the wearer's ship or station embroidered in gold until 1941, when this was replaced with a generic "U.S. Navy" as a wartime security measure. ^ All ranks of warrant officer currently in use, CWO-2 through CWO-5, are commissioned warrant officers and therefore technically commissioned officers. The noncommissioned warrant officer rank WO-1 is not presently in use. ^ a b Faram, Mark D. (9 October 2015). "Sweeping uniform changes emphasize gender neutrality". Navy Times. ^ The prescribed chinstrap for a Warrant Officer W-1 is narrow like a midshipman's and the cap badge is a pair of crossed anchors, but that rank is currently not in use. ^ Burke, R.P. (January 2017). "NAVADMIN 015/17". United States Navy. Retrieved 3 April 2017. Effective immediately and until further notice, optional wear of male E7 and above SDB trousers is authorized with the female SDB uniform. The manner of wear of male trousers is per current uniform policy. ^ Naval Personnel Public Affairs (18 May 2012). "Navy Announces New Uniform Components, Regulations". Department of the Navy. ^ Office of the Chief of Naval Operations (31 July 1972). "Women's New Dress Blues Aren't Blue". OPNAV Information Bulletin. Notes of Interest. Washington, D.C. 20350: Navy Department. Retrieved 23 November 2015. ^ Worthington, Rogers (5 July 1986). "Saluting A Return To Navy Tradition: To Rebellion And Back In A Decade". Chicago Tribune. Illinois. Retrieved 23 November 2015. ^ Chief of Naval Personnel Public Affairs Office (9 October 2015). "Navy Announces Rollout and Wear Dates for Upcoming Uniform Changes". All Hands. United States Department of the Navy. Retrieved 23 November 2015. ^ Navy Personnel Command (March 2014). "@USNPeople Uniform Newsgram" (PDF). Navy Uniform Matters Office. United States Department of the Navy. Archived from the original (PDF) on 6 February 2015. Retrieved 6 February 2015. ^ "White and blue crackerjacks moving forward". Navy Times. 20 April 2015. ^ United States Navy Uniform Regulations NAVPERS 15665. Accessed 10 February 2015. ^ Navy Personnel Command Uniform Components[dead link], Navy Uniform Regulations. Updated April 2010. ^ "Navy Uniform Frequently Asked Questions". New-Navy-Uniform.com. Archived from the original on 10 May 2010. Retrieved 19 October 2009. ^ Faram, Mark D (30 October 2008). "Blue cammies coming soon". Army Times Publishing Company. Archived from the original on 5 November 2009. Retrieved 5 November 2009. ^ McCullough, Amy (20 January 2010). "Your thoughts: Navy may try Corps-like camo". Marine Corps Times. Archived from the original on 12 June 2010. Retrieved 6 May 2010. ^ "Navy Working Uniform (NWU) Concepts Frequently Asked Questions". Task Force Uniform Public Affairs. United States Navy. 13 January 2005. Retrieved 6 May 2010. ^ "NAVADMIN 374/09: Navy Working Uniform Type II and III". Chief of Naval Operations. CDR Salamander. 4 January 2010. Retrieved 6 May 2010. ^ "Sailor Outcry over Desert Camo Denial". Navy Times staff. Marine Corps Times. 22 February 2010. ^ "Why Is the Marine Corps Fighting With the Navy Over a Camouflage Pattern?". The Atlantic. 17 January 2013. Retrieved 4 October 2014. ^ "NWU under fire: Report raises concerns". Retrieved 4 October 2014. ^ "Navy Announces Elimination of NWU Type I". 5 August 2016. Archived from the original on 5 August 2016. ^ "The U.S. military is dumping the dumbest uniform ever". 5 August 2016. Archived from the original on 5 August 2016. ^ "NAVADMIN 17214". Retrieved 12 June 2018. ^ Foutch, Michael (2 March 2006). "New Navy Working Uniform and Service Uniform Concepts Approved". Navy News Staff. Retrieved 5 November 2009. ^ US Fleet Forces Public Affairs. "Flame-Resistant Coveralls Coming to the Fleet Soon". US Fleet Forces Command. ^ "Navy uniform policy: 14 changes start now". Navy Times. 7 September 2015. ^ "USS Carney Tests Improved Flame-Resistant Variant Coveralls". 7 August 2016. Archived from the original on 7 August 2016. ^ "USNSCC Homeport" (PDF). USNSCC Homeport. ^ "Navy - Soldier Systems Daily". soldiersystems.net. ^ The Chief of Naval Operations and Commandant of the Marine Corps are heads of separate branches – the connections between the Navy and Marines include that they report to the Secretary of the Navy and they share common legal institutions like Naval Criminal Investigative Service and the Navy-Marine Corps Court of Criminal Appeals. ^ "Rainbow Wardrobe". U.S. Navy Office of Information. Retrieved 16 May 2007. ^ Chivers, C.J. (25 January 2012), "Potent Sting Is Prepared in the Belly of a Warship", The New York Times, nyt.com, retrieved 26 January 2012, A version of this article appeared in print on January 26, 2012, on page A6 of the New York edition with the headline: Potent Sting Is Prepared In the Belly Of a Warship. ^ "Captain and Crew". Naval History. Archived from the original on 1 May 2013. ^ a b Van Wyen, Adrian O. (1969). Naval Aviation in World War I. Washington, D.C.: Chief of Naval Operations. pp. 9 & 74. ^ Courtney Kube (17 July 2008). "New Navy uniform goes retro". MSNBC Digital Network. Archived from the original on 21 July 2008. ^ "Navy Announces Service Dress Khaki Cancellation". Military.com. 23 October 2012. Retrieved 10 December 2012. ^ "NAVADMIN 314/12". 19 October 2012. Retrieved 31 March 2017. ^ Van Avery, Chris (4 October 2004). "The good, bad and ugly of proposed uniforms". Navy Times. Army Times Publishing Company. Retrieved 16 October 2009. Combining a short- or long-sleeved white shirt with the blue trousers already in sailors' seabags eliminates the trouble of keeping summer white trousers white and Johnny Cash shirts unburned by a temperamental iron. ^ Van Wyen, Adrian O. (1969). Naval Aviation in World War I. Washington, D.C.: Chief of Naval Operations. pp. 33 & 74. ^ "On This Date in Naval Aviation History: Aviation Greens Make A Comeback". Naval History Blog. 8 April 2010. Retrieved 12 April 2010. ^ Navy Junior ROTC Cadet Field Manual (6th ed.). Naval Education and Training Command. August 2005. Retrieved 28 December 2018. Wikimedia Commons has media related to Uniforms of the United States Navy.